Sorry for the lack of updates this week! I had a little backlog of posts (completed projects I hadn’t written about) but I’ve gone through them all, so now I’ll be posting about things as I work on them – which means posts may be less consistent depending on what I get done. My newest project is another 1830’s dress. I liked my last project so much I decided to carry on the trend and do another garment from the same era! My main inspiration for this dress were this and this, though I used various other paintings and costume plates for reference as well. Some of those can be found on my new pinterest on the 19th century board. 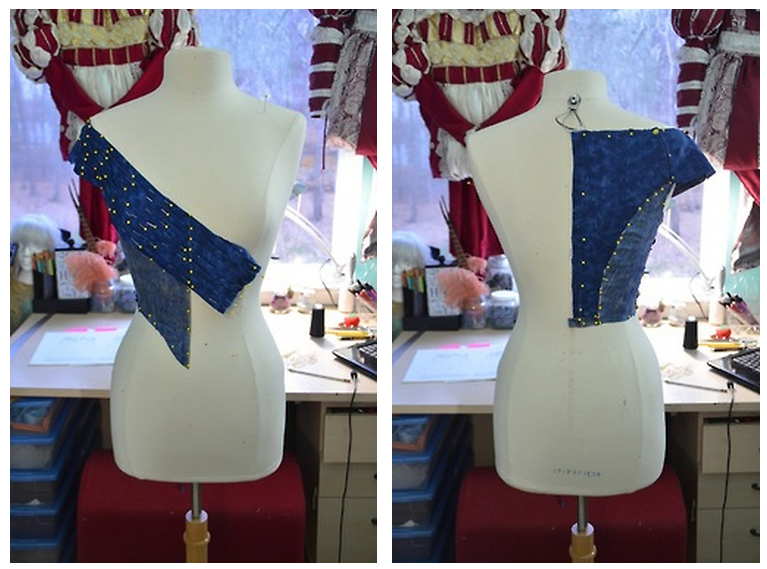 Step one in the dress making process was draping the pattern. I attempted this twice – the first time ended in disaster, but the second time went well, and in a few minutes it looked exactly how I wanted it to. I turned that into a paper pattern, which I used to cut out my mock up. I had to make a few alterations – the mock up was too long in the waist, the neckline was too high, and the shoulders too big. 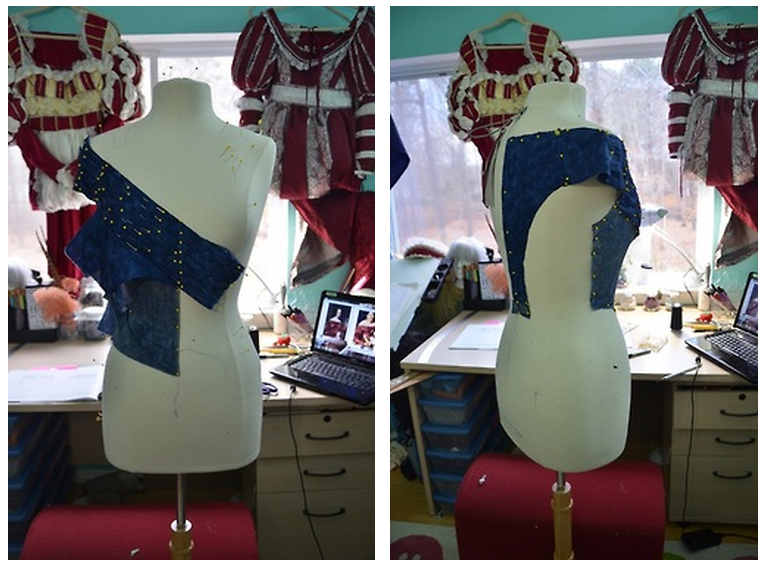 Luckily these were all simple changes, and after they were made I was ready to start work on the bodice! 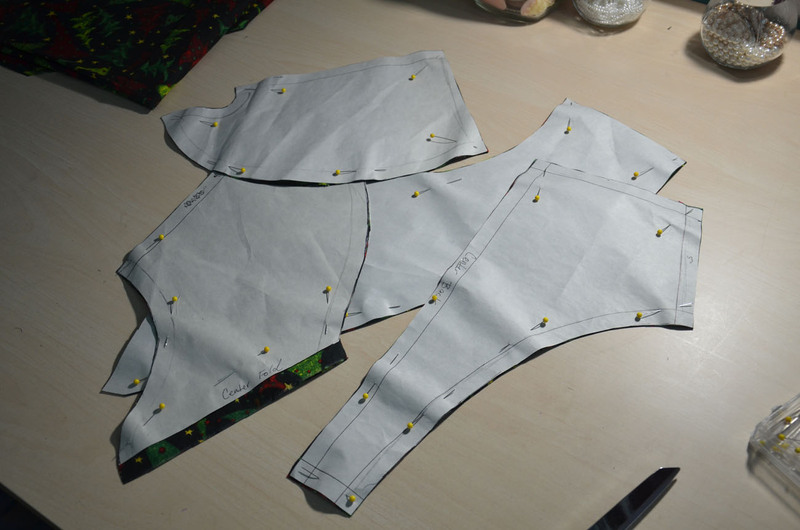 I cut my pattern out from cotton sateen which would be the top fabric. I also cut out a large rectangle which would be pleated down. 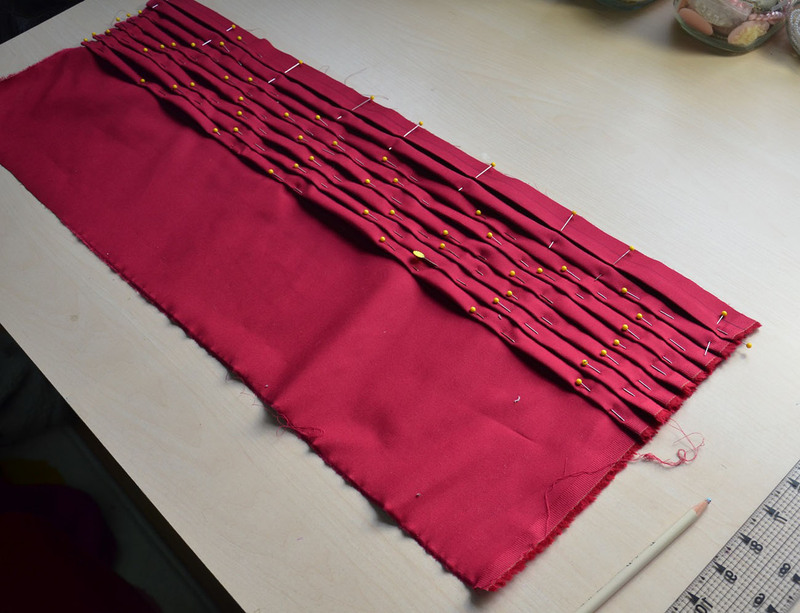 I marked out half inch knife pleats onto the wrong side of the fabric, then pinned them all in place. 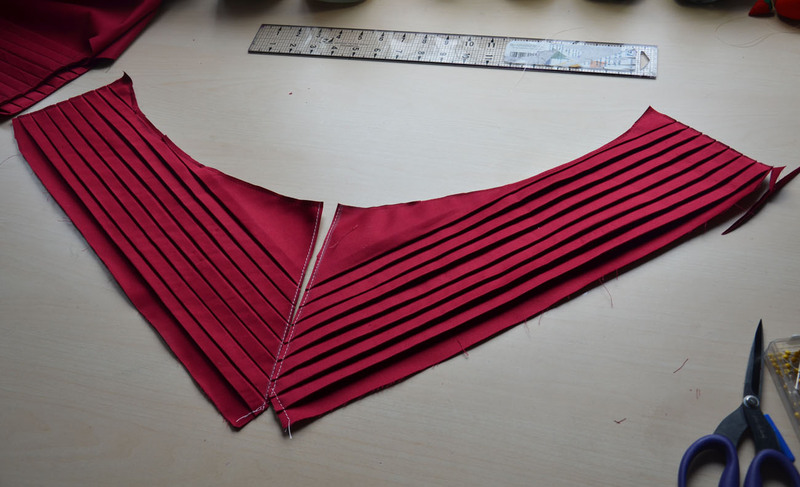 I’m not going to say too much about the process of pleating since i’m sure plenty of tutorials on this subject already exist. I sewed down each edge of the material, then carefully removed the pins. Every time I took out a pin I would iron the spot it was holding down. 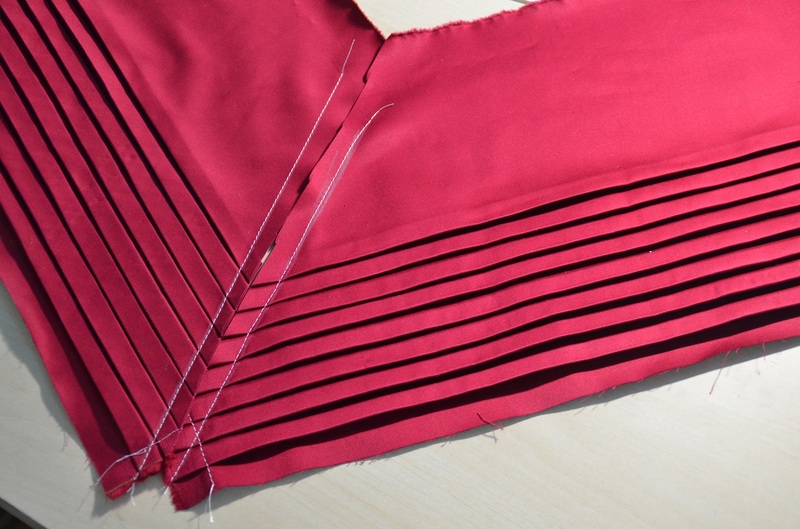 I used a very high temperature iron, and a lot of water to get these pleats as sharp as possible. 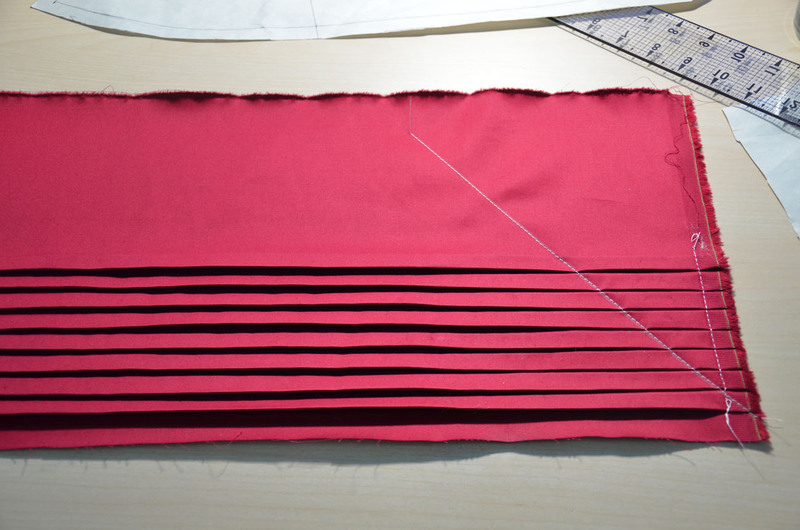 Then I drew a diagonal line over the pleats – this would become the center seam later on. 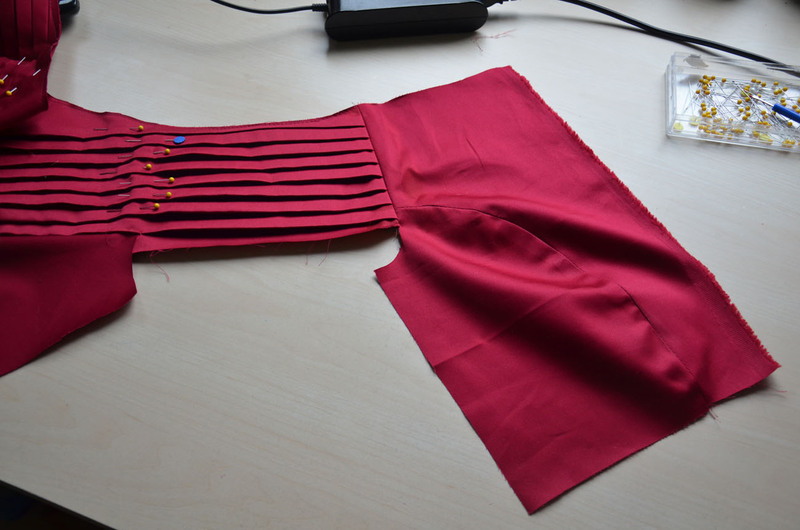 I also stitched across it to make sure the pleats wouldn’t move. A pleating god must have been smiling down on me, because these lined up perfectly! I was pretty damn giddy. I think having things line up requires a lot of skill, but also a good amount of luck. Then the panels were cut to the the right shape, and once that was done I officially had the most challenging part of this dress finished! 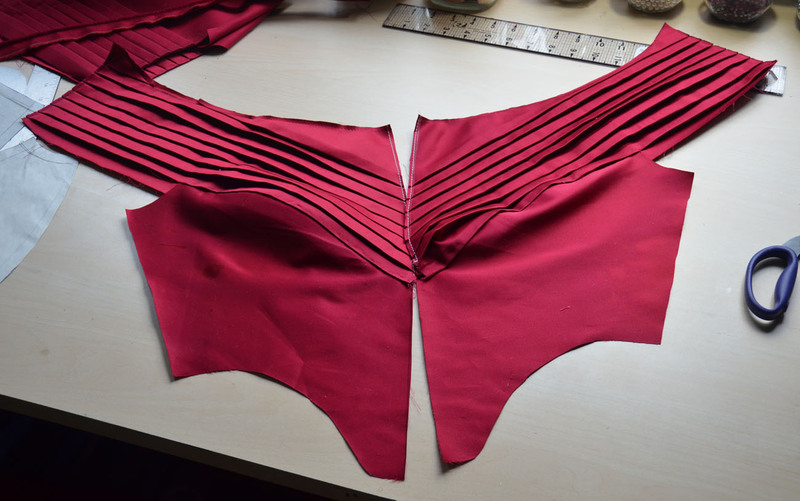 My beautiful pleated panels were then sewn on to the front bodice panels. This had to be done by hand to make sure no top stitching was visible. 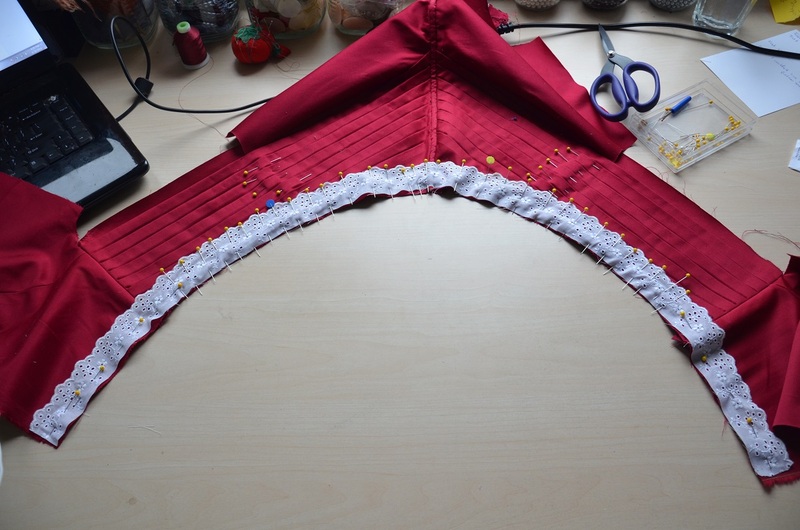 I made up a strip of piping that would go straight down the middle of the bodice. 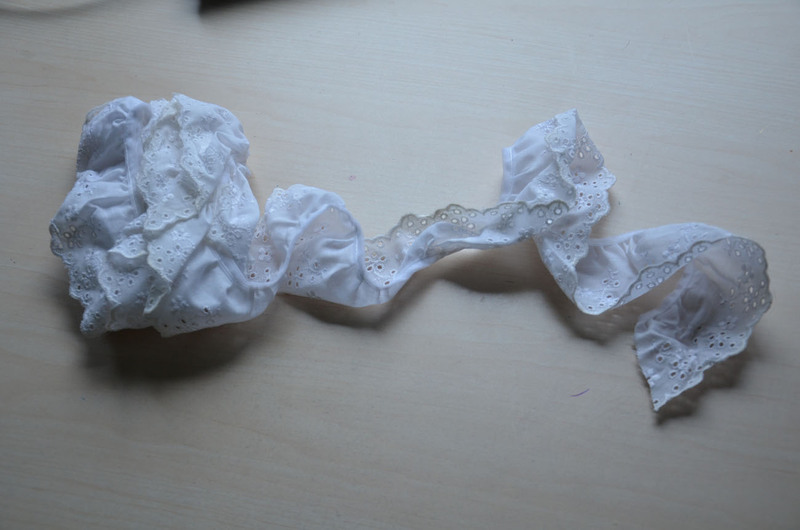 I feel like I should mention that this was the most frustrating part of making this dress. My machine was having a million issues at the time I made this piping (I decided the problem was a slightly bent needle – and another slightly bent needle which I used to replace the first one, a poorly done bobbin, and rayon thread being awful in general) so it seriously took me two hours. 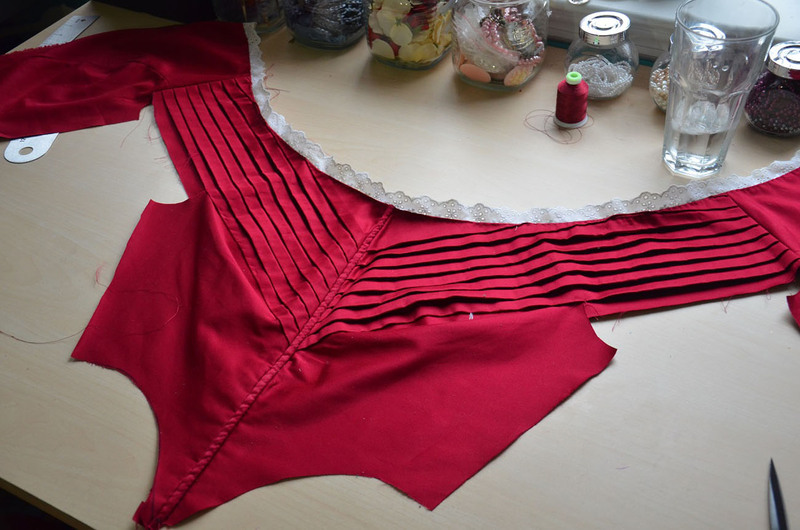 I sewed both of the bodice panels onto this – unfortunately with all the layers of fabric I couldn’t do a very good job. 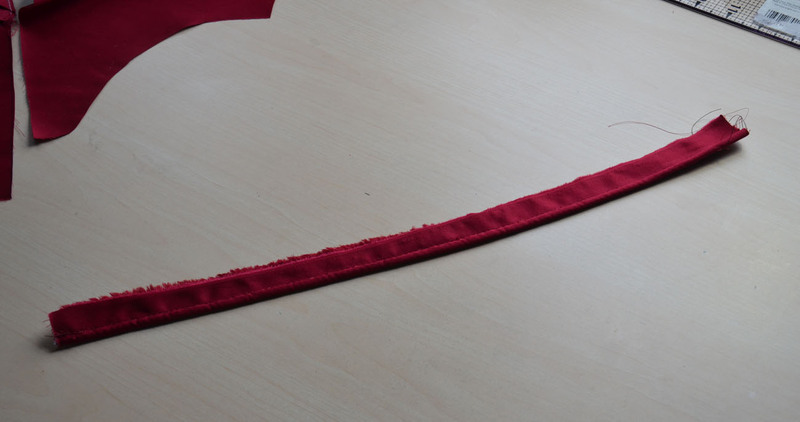 So I ended up whip stitching the piping closer to the fabric. Once that was done, it looked like this! 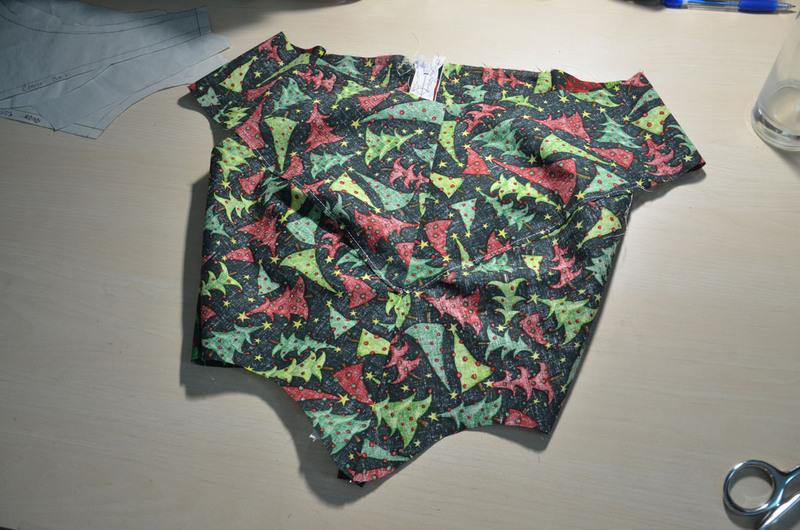 I realize now I should have used two layers of fabric to cover the piping. 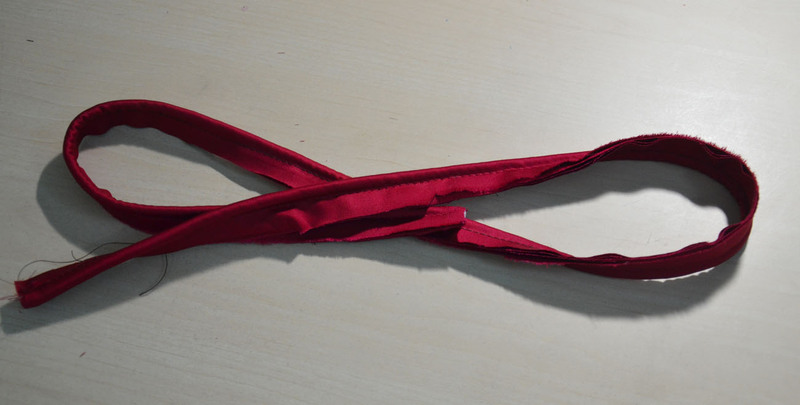 A bit of the rope texture shows through, but I did manage to iron it into submission so that is less obvious now. 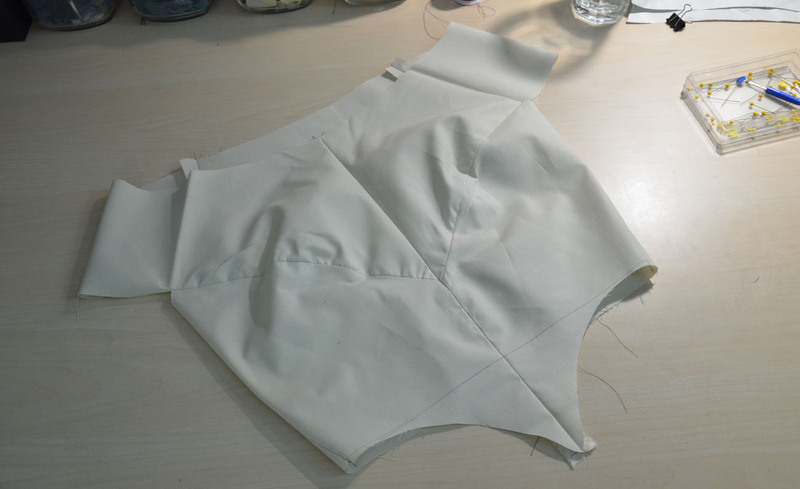 The next step was sewing the back panels together, then doing up the shoulder seam. And once those were attached I could add trim to the neckline! 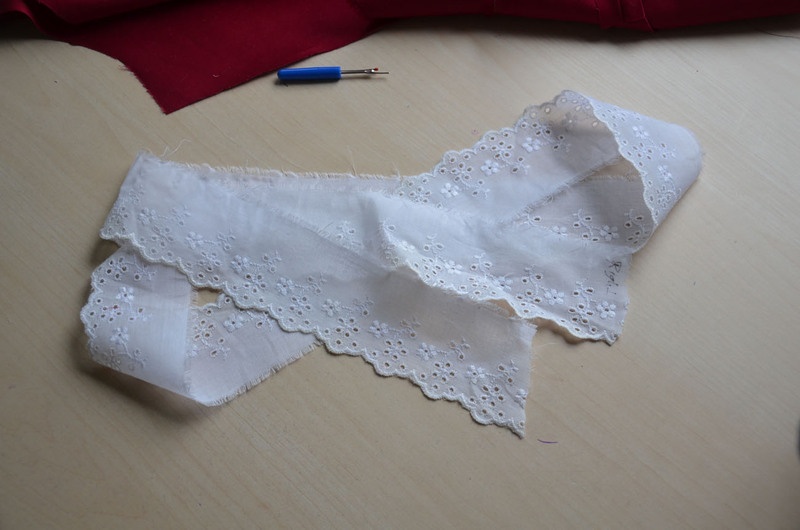 I decided on eyelet lace since it’s so cute, but the only eyelet lace I had was ruffled and to large, so I ended up cutting it down. The lace was pinned and sewn onto the neckline. Then I hand stitched around the neckline to secure it in place. 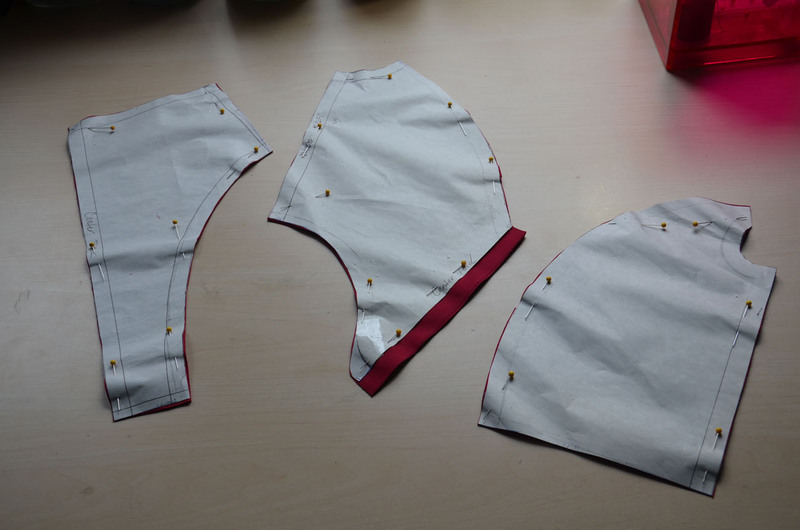 I did up the garment side seams and it actually looked like a proper bodice, so exciting! All it really needed was piping at the waist, so I went ahead and made that. This time I used two layers of fabric to avoid the rope texture showing through, and luckily I didn’t run into any machine errors! despite being super careful there are a few stitches visible from the front which really stinks, but the thread matches well enough that it shouldn’t be too obvious. Lastly it needed lining. I used a lightweight cotton for this task. 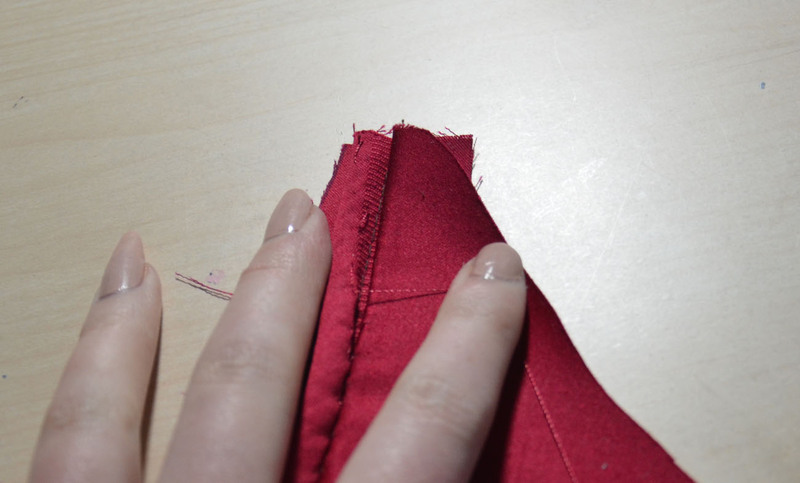 It got sewn in the way you would expect – the bottom edge can’t be sewn until the skirt is attached. 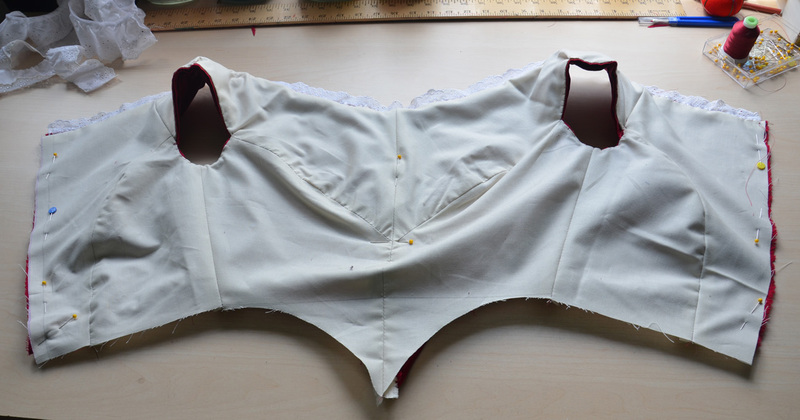 But that’s that, the bodice is finished! 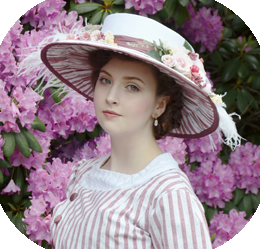 My next post will either talk about making the bonnet, or be about the sleeves and skirt. The pleating is outstanding but what really got me was your comment on the initial design. The neck was too high, shoulders too big……it was an easy fix. What a long way you’ve come that what would be to most of us insurmountable problems you now see as minor inconveniences. Your experience is showing !!! Thank you! I don’t think necklines have ever given me too much trouble – but you should see the last set of stays I made, the pattern was two inches too big so I had to start all over again ha. I don’t worry much, the dresses I have hanging in direct sunlight are all quite old and poorly made. They can’t be worn again, and will eventually be torn apart and used as scrap fabric. My more recent projects are hanging in a closet! I’m so jealous. Your eyes must be sharper than an eagle’s because I must have stared at your pictures for half an hour and I didn’t see a single one of those stitches you were talking about. I tacked the pleats after taking that photo, thats why you can’t see them! They are a little more visible in these worn photos, but still not too obvious. The thread really did match quite well – both in sheen and color, so it’s pretty hard to see. I think in direct sunlight it would be more obvious. 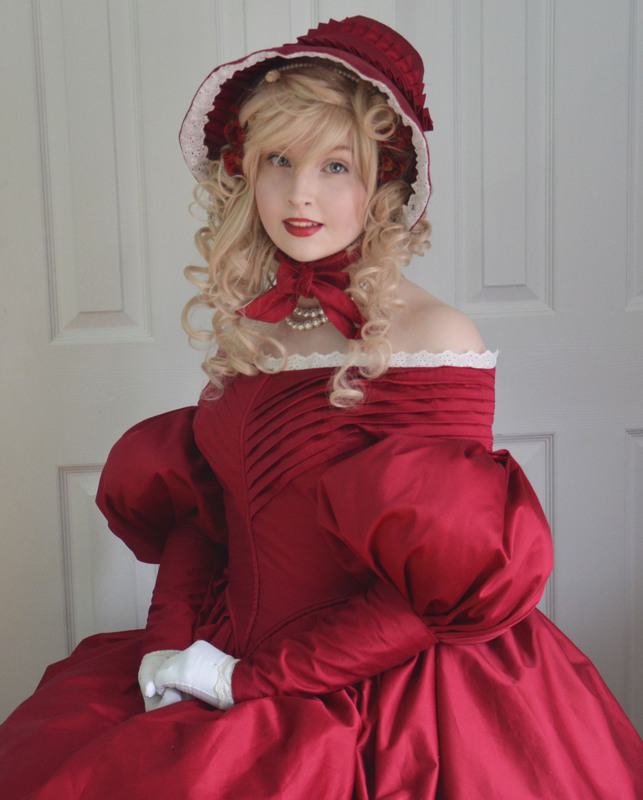 You are one incredible, gorgeous, talented costume maker, with great imagination and a wonderfull eye for details! And i am happy i found your blog, i can not wait to see the way you go! Outstanding for such a young girl! I love your pleats! they are so perfect! 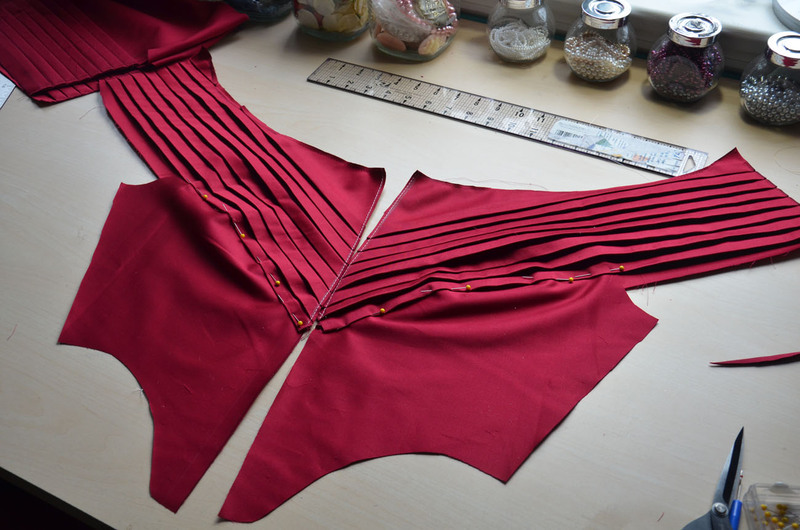 I was going to ask you, I have been trying to start on a skirt with pleats attached to the waistband and a zipper in the back, but I’m not sure how to orient the pleats so that they are even all around. Do you have any advice on that? I’m not sure what you mean by even all the way around? 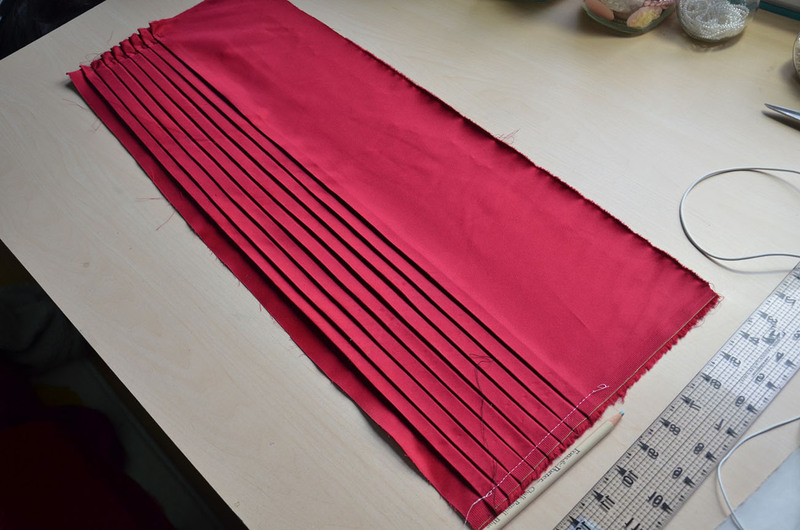 A ruler is a very important part of making pleated skirts, and if you measure and pin carefully they should all come out the same size! Did you make your own pattern then? If so, is there any way I could use it? I absolutely love it!